Any chance of Ossuary going on Steam Greenlight? If you need the hundred bucks needed to pay the one-time Greenlight-fee (one time for any number of games), just ask. This is rather good. I first stumbled upon your work when I discovered How to raise a dragon, I subsequently played Majesty of Colors and Necropolis, then all of your other webgames. I especially loved Looming, the overall emotion of which I still have rather strong feelings for and go to relive from time to time. Something in my mind resonates rather well with these games. The Hodge-Podge Transformer is an entirely different thing, but quite interesting all the same. I like the way the small world and the characters are built, and the conversations one has with them. 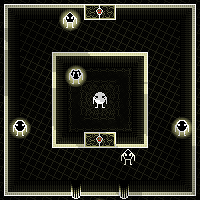 Currently I am lacking the time to buy and play Ossuary, although I hope I will find it in the near future. So for now I just wanted to tell you how much I like your games and encourage you to keep up your creative work.